Small but powerful Typhoon Songda continued moving to the northeast and over the open ocean of the Northwestern Pacific Ocean when NASA's Terra satellite passed overhead and saw its cloud-filled eye. 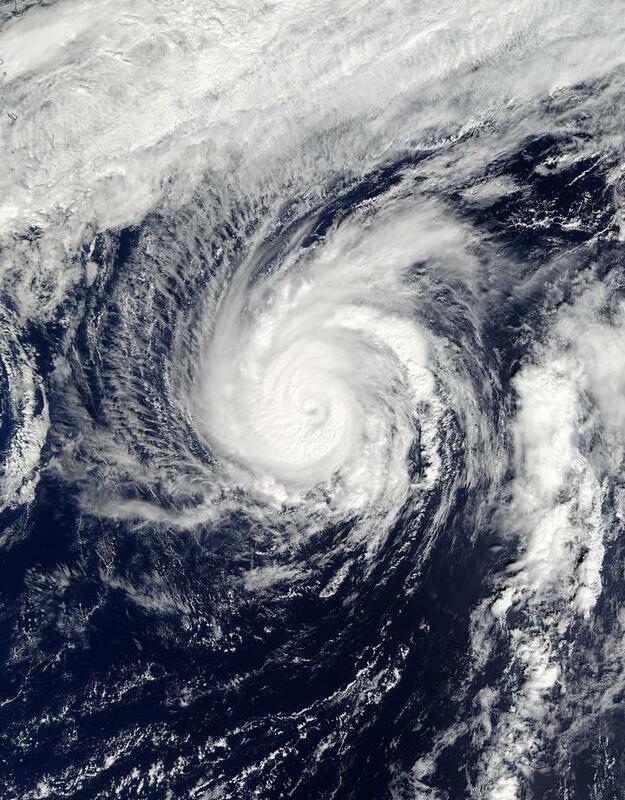 Tropical storm Songda, the twenty-third tropical cyclone of the northwestern Pacific Ocean formed on Oct. 9. At 5 a.m. EDT (0900 UTC) Songda was located about 488 miles east-southeast of Iwo To island, Japan. On Oct. 10 at 8:45 p.m. EDT (Oct. 11 at 00:45 UTC) The Moderate Resolution Imaging= Spectroradiometer or MODIS instrument aboard NASA's Terra satellite captured a visible-light image of Songda. MODIS saw powerful thunderstorms circling Typhoon Songda's 20 nautical mile wide, cloud-filled eye. Stronger storms appeared a brighter white than those storms surrounding the center. On Oct. 11 at 11 a.m. EDT (1500 UTC) Typhoon Songda's maximum sustained winds were near 100 knots (115.1 mph/185.2 kph). Hurricane-force winds were occurring up to 30 miles from the center, while tropical storm force winds extended just 90 miles. Sondga is a compact storm. It was located far from land areas and about 538 nautical miles southeast of Yokosaka, Japan near 29.3 degrees north latitude and 147.6 degrees east longitude. Songda was moving to the northeast at (11.5 mph/18.5 kph). The Joint Typhoon Warning Center forecast noted increasing vertical wind shear and cooling sea surface temperatures will rapidly erode the system. Songda is forecast to begin weakening and become extra-tropical over the next two days.